Another great issue as always, this is my first look at all these characters. I have to say I like the other Raven better. Mr. Risk looks pretty good and I really liked the Spider Widow. As for Zippo, great art, but the hero is very cornball and I am a fan of corny characters. Keep up the great work and I hope to see even more obscure characters next month. Richard, I like corny characters, too! I had a similar reaction to the Zippo story - I liked the art (I found it slightly Kirby-esque), but didn't care for the story when I first read it. Liked it better when I re-read it while scanning it, tho', for some reason. I chose the Mr. Risk story because it had that great villain. Hopefully Steel Fist and Micro-Face were obscure enough for you this issue! Hello - Your April "issue" was especially interesting. I thought that I had heard of them all, but I had never heard of any of them from this issue - Zippo was the biggest suprise - I wouldn't mind seeing more of his stories - or even the VERY unusual Spider Widow. Some other story suggestions (if you have access to any of them) --- Unknown Soldier: Often appeared in "Four Favorites" from the same company as Magno. Cat-Man: from Holyoke. Black Cat: from Harvey or any other Harvey heroes like her and Captain Freedom. The Flame: from Fox. More Nedor - or how about some of the "Archie" line of heroes. Black Owl again. I don't know if you have access to some of these - but they're just suggestions. Thanks for the fun site. J.B., thanks for taking an interest in my site! I always enjoy getting letters from my readers and welcome any suggestions. I have one Unknown Soldier story which will either appear on the site or on a Pure Excitement Comics Super Special CD-ROM at some point in the future. Don't worry, the CD-ROMs will never replace the web site, just offer additional material. Some stories need to be presented at higher quality to maintain readability, so I plan to offer those on the CDs, along with other neat stuff. I also have one issue of Cat-Man, but the Cat-Man story has already been reprinted in AC Comics' Golden Age Men of Mystery, so I'm not going to re-reprint it. Some of the other material may appear in the future. I've stayed away from reprinting Black Cat stories because the character has been kept somewhat active by the copyright holders. However, other "abandoned" characters from that publisher will be featured, such as the Human Meteor, Dr. Miracle and more Capt. Freedom. I don't personally own any Flame stories, sorry. More Nedor is definitely planned, but I'm still staying away from the Archie/MLJ line of heroes because Archie still utilizes them occasionally. More Black Owl is also a possibility. Thanks again for reading! Hey, I just recently found your site and I have to say it's pretty amazing. I haven't been able to stand looking at modern superhero comics for the past decade or so. Your Golden Age reprints present superhero stories the way they should be: fast and colorful, without too much pretension or psychological agonizing. I'm looking forward to digging in to your back issues. Did any of these publishers ever attempt a JSA-style superteam? Do you have any stories like this, if they exist? Jason, thanks for checking out my site and writing in to me. I enjoy hearing from my readers. I only know of a couple of other super teams, but they were both really short-lived. There was a team-up of Capt. Marvel, Bulletman, Bulletgirl and Minute-Man as the "Crime Crusaders Club" in Master Comics #40. Also, a group of heroes in Prize Comics teamed-up in #24 of that comic to hunt down Frankenstein. They were the Black Owl, Yank & Doodle, the Green Lama and Dr. Frost. The Fawcett story was reprinted (in a slightly altered form) by AC Comics some years ago. I don't think the Prize story has ever been reprinted and I don't own a copy. Enjoy the back issues! 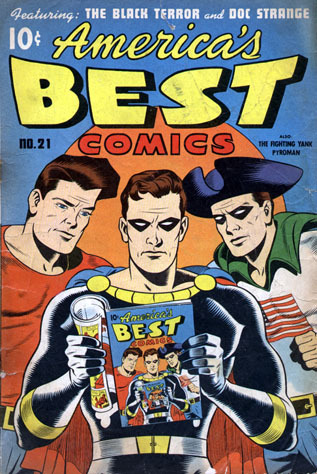 In the gallery this month is the cover of America's Best Comics no. 21, featuring a great infinity cover. On the cover are Doc Strange, the Black Terror and the Fighting Yank. Artwork originally ©1947 by Visual Editions, Inc.